Employee recognition is limited in most organizations. Employees complain about the lack of recognition and appreciation regularly. Organizations fail to realize the power of providing frequent and sincerely meant employee recognition. They are unaware of the impact that solid recognition and employee thank yous would have on employee motivation, engagement, and retention. And, life at work is busy, busy, busy. There are always too many priorities and goals. Nearly every employee has enough work to fill a 40 hour work week or more. These factors combine to create workplaces that fail to provide recognition for employees. Managers who prioritize employee recognition understand the power of recognition. They know that employee recognition is not just a nice thing to do for people. Employee recognition is a communication tool that reinforces and rewards the most important outcomes people create for your business. When you recognize people effectively, you reinforce, with your chosen means of recognition, the actions and behaviors you most want to see people repeat. An effective employee recognition system is simple, immediate, and powerfully reinforcing. Employees feel cared about and appreciated. It may seem simplistic, but people who feel recognized and cared about produce more and better work. In a client employee satisfaction survey, the question of whether the company cared about the welfare and happiness of its employees drew divergent views. Some people agreed; others disagreed. The environment was clearly not awash in employee recognition. So, the Culture and Communications team put out a second survey asking what would make the employees feel as if the company cared about them. The team members developed several answers that employees could check and supplied room for their comments and additional thoughts. Fifty-five percent of the respondents said that praise and attention from their supervisor would make them feel as if the company cared about them and their well-being. As you might also expect, money, benefits, and events such as company lunches ranked high, too. But recognition from the supervisor or manager ranked above all other choices. In employee satisfaction surveys in different organizations, the findings are always similar. Employees want to know that they have done a good job—and that you noticed. Employees want to be thanked and appreciated. A leader of employees makes other people feel important and appreciated. The leader excels at creating opportunities to provide rewards, recognition, and thanks to his or her staff. A leader creates a work environment in which people feel important and appreciated. Want to Kick Employee Recognition Up a Notch? You can reinforce powerfully the recognition you provide in these ways. Write out the recognition, what the employee did, why it was important, and how the actions served your organization. Give a copy of the letter to the employee and to the department head or CEO, depending on the size of your company. Place a copy in the employee’s file. Write a personal note to the employee. Perhaps have your manager sign it, too. Photocopy the note and place the recognition in the employee’s file. Accompany the verbal recognition with a gift. Engraved plaques, merchandise that carries the company logo, even certificates of appreciation reinforce the employee recognition. Everyone likes cash or the equivalent in gift cards, gift certificates, and checks. If you use a consumable form of employee recognition, accompany the cash with a note or letter. When the money has been spent, you want the employee to remember the recognition. Present the recognition publicly, at an employee meeting, for example. 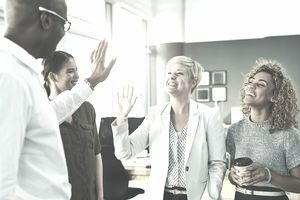 Even if the employee is uncomfortable with publicity, it is important for the other employees to know that employees are receiving recognition. A simple “thank you” counts as employee recognition. But, you can also make employee recognition as elaborate as your imagination can conceive. Recognition should not be a scarce resource. You cannot use recognition up. You cannot run out of recognition. No budget is too small to afford employee recognition. For increased employee satisfaction, bring on lots of employee recognition. You'll be happy that you did.